Cantilevered signal, sign, and light support structures are used nationwide on major interstates, national highways, local highways, and at local intersections for traffic control purposes. Recently, there have been a number of failures of these structures that can likely be attributed to fatigue. In light of the fact that there is considerable uncertainty in the calculation of vortex shedding loads in both the American Association of State Highway and Transportation (AASHTO) and the Canadian Highway Bridge Design Code (CAN/CSA) code provisions, the current equations used for vortex shedding fatigue design need to be reevaluated and likely re-formulated or modified. A luminary support structure or High Mast Light Pole (HMLP) is generally susceptible to two primary types of wind loading induced by natural wind gusts or buffeting and vortex shedding, both of which excite the structure dynamically and can cause fatigue damage. Vortex shedding is a unique type of wind load that alternatively creates areas of negative pressures on either side of a structure normal to the wind direction. This causes the structure to oscillate transverse to the wind direction. The primary objective of this study was to develop a procedure for predicting wind loads in the time domain for the fatigue design of slender, tapered luminary support structures. To accomplish this, monitoring of long-term response behavior of a HMLP subjected to wind-induced vibration was needed. 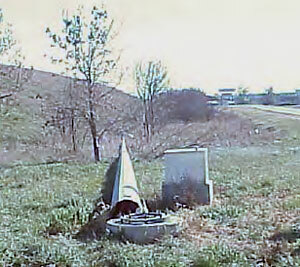 This was accomplished by full-scale measurement of the response of a HMLP located near Mason City next to I-35 in Iowa. Wind tunnel testing was also conducted to determine the required aerodynamic parameters of the pole cross section. Further, these aerodynamic parameters were cast into a coupled dynamic model for predicting the response of any HMLP in the time domain. Finally, the model was validated by comparing its results with the data collected from field monitoring.